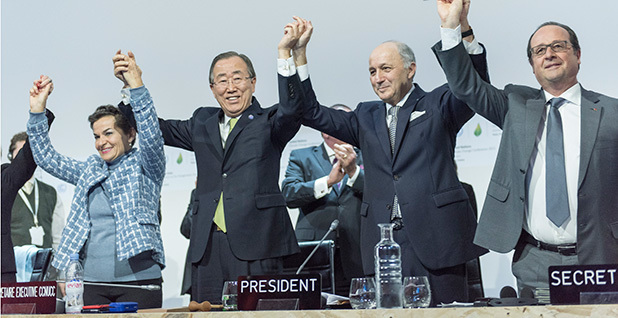 U.N. Secretary-General Ban Ki-moon is flanked by U.N. climate chief Christiana Figueres (left), former French Foreign Minister Laurent Fabius (second right) and French President François Hollande (far right) to celebrate the adoption of the Paris climate agreement last year. Tomorrow, leaders of more than 150 countries will gather at U.N. headquarters in New York to sign the deal into force. Photo courtesy of the United Nations. Most of the countries that agreed to last year's landmark Paris climate deal will converge on New York tomorrow to officially endorse it. Officials from more than 150 nations are expected to be on hand when the agreement opens for signatures at U.N. headquarters in Manhattan. U.N. Secretary-General Ban Ki-moon asked heads of state early this year to make the journey to sign the deal themselves, and more than 60 heeded his call. Secretary of State John Kerry will sign the deal for the United States because President Obama is traveling in Europe. Ban has called the projected turnout "truly historic." "The spirit of Paris is still living on," he said during last week's World Bank and International Monetary Fund meeting in Washington, D.C. The previous record for most signatures garnered by a U.N. deal on its first day open was 119 -- set in 1984, when the Law of the Sea Treaty opened for signature. The gathering at U.N. headquarters will run into the early afternoon, with heads of state or foreign ministers adding their John Hancocks to the climate text and making statements to the plenary. Kerry will give a morning statement after which he will sign the agreement, a senior State Department official said yesterday. The official said the U.S. process for joining the deal would be "standard," noting, "We have committed to completing that as early as possible this year." Several other countries have also committed to early action. Tomorrow night, six countries are expected already to be parties to the Paris Agreement -- meaning they will have both signed it and delivered documents to the United Nations formally adopting the deal. They are Fiji, the Marshall Islands, Palau, Maldives, Belize and Barbados -- all nations vulnerable to sea-level rise that have ratified early to draw attention to their plight. Peter Thomson, Fiji's permanent representative to the United Nations, said this week that the mission already has ratification paperwork in hand and is ready to deliver it tomorrow. 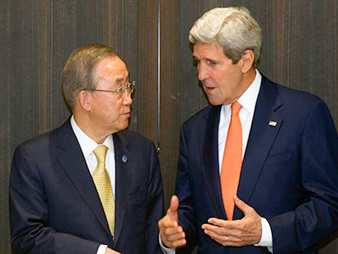 "What we'll be after of course is a raising of ambition," he told ClimateWire. "Otherwise, we're in real trouble." The State Department official said the list of early ratifiers was likely to grow before long. "We understand from some informal conversations that there are more than a dozen who are prepared to do this, but we don't have confirmation really, precisely," the official said. "Part of what I think of what we'll get on Friday is that understanding." The agreement takes effect when 55 countries totaling 55 percent of the world's greenhouse gas emissions have joined, and it seems possible that that could occur later this year. Secretary of State John Kerry will be among the leaders of more than 150 nations in New York tomorrow joining U.N. Secretary-General Ban Ki-moon in signing the Paris Agreement on climate change into force. Photo courtesy of the United Nations. The United States and China, which are responsible for a combined 38 percent of the world's emissions, announced last month that they would join the deal this year. That's a move Jake Schmidt, international program director at the Natural Resources Defense Council, predicted "will create a cascading impact across the world" as other countries hasten to follow. "Getting to the 55 percent threshold is much easier with those two countries in," he said. "You couldn't get there without them in." Canada pledged separately in an agreement with the United States that it would ratify this year, bringing the total to about 20 percent, according to a new Paris Agreement Tracker created by the World Resources Institute. Island states and other major developing emitters like India, South Africa and Brazil have also called for swift ratification. The addition of those countries would bring the total within reach of 50 percent. Energy Secretary Ernest Moniz, speaking at a breakfast sponsored by the Christian Science Monitor, said yesterday that the momentum behind the climate agreement is building and that the United States' commitment bodes well for the prospects of getting others to sign on. "I think it is going a lot faster than any of us expected," Moniz said. "I think certainly against any reasonable set of expectations, I think it's passed them." The signing, which coincides with Earth Day, is an opportunity to remind the world of what was achieved in Paris, said Reid Detchon of the U.N. Foundation. "There was a concern that after the big event in Paris it would slip off the radar screen and sink between the waves," he said. But a blockbuster turnout in New York serves to "keep the issue highly visible; the need for urgency, the pressure for rapid entry into force and implementation," he said. The agreement reached by 196 countries in December was the first truly global bid to reverse man-made warming and cope with its effects. The deal called for the world to work together to keep postindustrial warming "well below" 2 degrees Celsius -- with an aspiration target of 1.5 C -- and enshrined more than 180 national pledges of action. Estimates show that the initial pledges would place the world on track to limit warming to 2.7 C, which is why Paris also calls on countries to put forward new targets -- or to consider revising existing ones -- at five-year intervals. Some critics worry that the Paris deal doesn't go far enough to protect the most vulnerable nations, which face large-scale damage or population displacement due to sea-level rise and other warming-driven impacts. And while the agreement calls for net-zero emissions by the second half of this century, many have said since the Paris deal that nearer-term progress would be key. U.N. climate chief Christiana Figueres says the world must peak emissions in 2020 to stay on course for 1.5 C.
Moniz said he too believes the Paris commitments are just the beginning of efforts to keep climate change in check. "I would argue for sure that Paris was really a big first step. ... I do think that, 10 years from now, we're going to need another big step," he said. "The pace of decreasing carbon intensity will need to double from 2020 to 2025, relative to this decade's pace. We do have to pick it up." Tying the hands of a GOP White House? A new report released today by Chatham House shows that countries must close the gap when they offer their next tranche of emissions commitments in 2020. If they wait until 2025, the British think tank says, it will be too late. The same report notes that energy infrastructure built in the next few years will continue to operate well into the second half of the century, and the proliferation of new fossil fuels facilities now would jeopardize the Paris deal's long-term objectives. Governments and climate advocates are calling for the early entry into force of Paris in part to signal the market that the world is abandoning fossil fuels in favor of lower-carbon alternatives. "It does give certainty to governments and to the private sector that governments are standing behind what they negotiated last year," said Alden Meyer, director of strategy and policy for the Union of Concerned Scientists. While it took seven years for countries to ratify the Kyoto Protocol -- and some, like the United States, never did -- a speedy entering into force for Paris would show that countries now understand the urgency of addressing warming and are anxious to fully implement their commitments, he said. The possibility that the agreement would take effect before 2020 took many by surprise. Those who follow the process say it's hard to determine who chose to remove language in previous drafts that would have barred early entry, except to say it seems to have had the support of the conference's French presidency (ClimateWire, April 8). But one of the results is that if Obama leaves office after the deal enters into force, that will make it more difficult for a subsequent administration to withdraw the United States from the deal. Standard U.N. agreement language in the deal means that any country that has joined it must wait a total of four years before a decision to withdraw is final -- but only if it has taken effect. "The treaty then could be effective, at least if you believe it hasn't been unlawfully adopted, starting this year or early next year, and the next president of the U.S. would be stuck with it for the duration of his term," Marlo Lewis, senior fellow at the Competitive Enterprise Institute, said at an event this week aimed at shoring up GOP resistance to Paris. "But you can't withdraw from a club, and there's no need to withdraw from a club you didn't join in the first place." The Obama administration has said it will treat Paris like an "executive agreement" not requiring Senate approval, but Republicans argue that the United States should not be considered a party unless the Senate votes to ratify it. Laura Sheehan, spokeswoman for the American Coalition for Clean Coal Electricity, said the uncertainty about where the "entry into force" language came from showed the lack of transparency in the U.N. negotiations. "The fact that many top U.S. officials, diplomats and astute observers of the negotiations have no idea who is responsible for the date modification is representative of the entire process," Sheehan said, adding, "Much like Obamacare, it looks like the accord will need to be signed before we can learn what's actually in it." While a Republican administration might not be able to withdraw the United States from the Paris deal immediately, it would have little difficulty scuttling many of the policies that underlie the U.S. pledge to cut emissions between 26 and 28 percent below 2005 levels by 2025. But activists say tomorrow's record turnout in New York shows that backing away from commitments made in Paris could damage U.S. credibility abroad and hamstring a new administration on a host of unrelated international priorities. "The reality is that what we're seeing -- and the next administration will see this -- is a very strong global consensus that we have to deal with climate change, and this is a top-tier issue," Schmidt said. "A future president who chooses to not implement the kinds of actions that would deal with this challenge will see the geopolitics of this issue shift around them." Moniz, for one, said he is confident there is common ground in the climate fight. "We have an issue with the Congress, obviously," he said. But, he added, "there has been strong bipartisan support for this focus on innovation. Both chambers, both parties." In addition, the impacts of climate change will grow harder to ignore, and much of the progress so far is baked in. "Mother nature will keep speaking to all of us," Moniz said. "Public opinion, I believe, is and will continue to move in the direction of understanding that we do need a response." Reporters Elizabeth Harball, Umair Irfan and Camille von Kaenel contributed.